0minously, by the time this premiere finished the sun had just about set. Guess it's time to get the multiple thermal jumpers and jackets and beanies out of storage. Winter is indeed coming.... but good news for fans of lens flares and starbursts : my Nikon, which was damaged at the GQ Awards a few weeks back, has been repaired and is back on duty, ably assisting my Pentax. With his sign suggesting he'd been labelled a member of the filthy press, young Tony was feeling that journalism no longer had the sparkle it once did as a profession. (Times are tough, yo). Eddie Marsan (most recently photographed at the premiere of "The Worlds End") is in this movie, and has just been reunited with James McAvoy, who coincidentally is also in this movie. "Sorry, Filth Press, I can't answer any questions about this movie : can't you see I'm signing X-Men Merch?" James McAvoy played Professor X in X-Men : First Class and will do so again in its designated sequel whose name currently escapes me. "It's going to be called Days Of Future Past and you should totally watch it. Also you should totally watch this film. It's really good"
"You say there's a zombie behind me? Guys, you're not making any sense right now. I'll be over to sign autographs later." 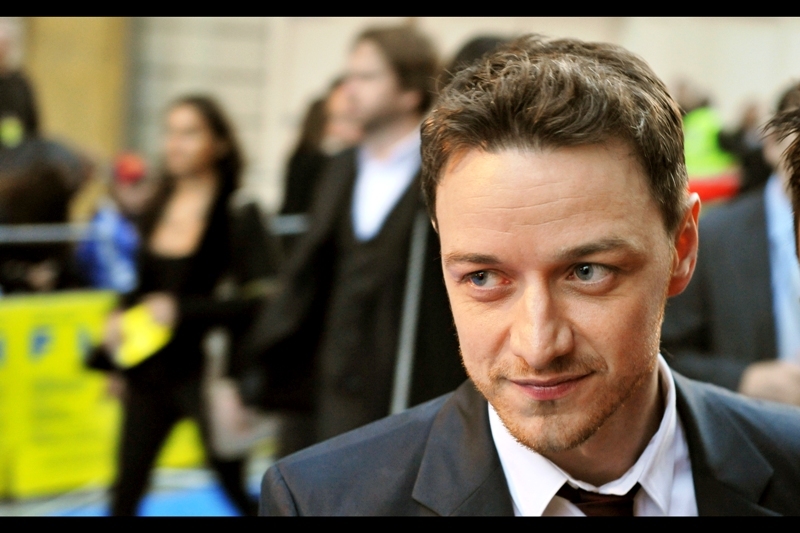 James McAvoy was also in Wanted, Atonement and had a role in "Arthur Christmas" (though he was not at that premiere). He's also happy to pose for as long as necessary to nail that wistful look. I don't know who this is, but dressed like that, how can she not be famous? (edited to add : she's apparently called Dakota Blue Richards. I don't know who that is, but I'm pleased she has a name). Another photo. Just because... you know... don't want this journal to be nothin' but a James McAvoy, Irvine Welsh and Eddie Marsan zone. "Hey, pretty lady. Did I mention I'm in movies??" "James, I was in that movie with you. I'm in the credits"
Joanne Froggat has arrived and she is indeed in this movie. "Eeeeee!!! James McAvoy remembers me!!!!" Sure, kind of. Joanne Froggat is also in Downton Abbey, a TV series I have thus far staunchly declined to watch, though I do have the Season 1 DVD in my apartment somewhere. But there are so many DVDs in my apartment, and the pile includes the Best Picture winner from 1941 and a Will Ferrell comedy. So... you know... priorities. "You're skyping your cousins in Albania and they don't even have a TV let alone a cinema but you want me to wave to them anyway? Okay!!" The awesomely named Imogen Poots arrives. The name rings a bell (because I think once you've heard it once, it's never going to be mistaken for any other name, ever), but I don't think I've ever photographed her and can't recognise her from anything. Wow. Imogen Poots was in V for Vendetta! That's totally one of my favourite films ever, and it's almost coming up to November. Time to dust off that DVD / Bluray. "You wanna take a photo of me signing something on a piece of paper? Go ahead, whatever floats your boat, Babe". Erm... I've got leftovers in the fridge. That means I don't have to make dinner, which means I'm doing this in my spare time. Nothing more. Almost time to get in a wheelchair and go bald, young man. Future X-Men prequel sequel / reboots await. "I actually can't wait to shave the hair : it'll take valuable seconds off my 100m lap times". That's why I choose my hairstyle like that. To sumarise, though: movie about a man riding a pig. If taken literally. Blue Jasmine - Cate Blanchett! Sally Hawkins! The Lone Ranger - Depp! Verbinski! Bruckheimer! The Wolverine - Jackman! Mangold! Janssen! Others!